It's okay to slap a couple of extra minutes of footage into an old movie and call it something new when you're giving away a portion of the profits to charity. And that's exactly what Ryan Reynolds and his team are doing with Once Upon a Deadpool. Today, we get a new poster for what is essentially Deadpool 2 with some new scenes duct taped to it. This is the second poster for Once Upon a Deadpool. The first showed a suited up Wade Wilson riding a fully grown Rudolph the Red Nose Reindeer, complete with Fred Savage at his back. Fred is being used heavily in the promotional material, as he appears as a heavenly angel on this latest one-sheet. 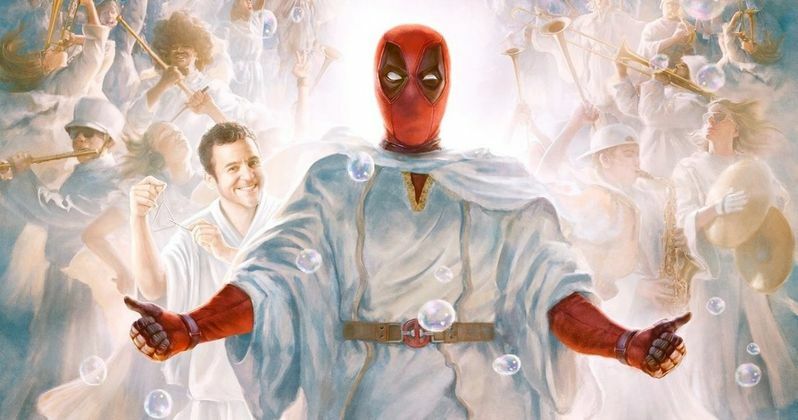 Deadpool and Savage, both wrapped in white robes, are surrounded by a bunch of jubilant angels and tiny floating bubbles. There is even a cute little dog thrown in the mix. Cute until you consider that the dog is dead, leaving his owners grieving for the holidays. Some believe that is John Wick's dog. Which it very well could be, John Wick and Deadpool 2 were directed by the same guy. Once Upon a Deadpool is confirmed to have 20 all-new minutes of never before seen footage. This mostly consists of wraparounds. Wade has kidnapped Fred, and will read him a bedtime version of Deadpool's latest antics, culling censored footage from the previous two movies, erasing all the swears and graphic violence. The first two Deadpool movies were rated R. This new clean cut version arrives as a PG-13. Some though it was a cash grab, or a means to show Disney that Deadpool could work in the MCU. Ryan Reynolds clarified that this wasn't the case. Fox has been hounding him for a more family friendly version of Deadpool for years, and he decided to deliver the ultimate Deadpool Christmas gift, with a portion of the proceeds going to Fudge Cancer, which used to be the F*** Cancer charity, but it too has been censored in the spirit of the holiday. Ryan Reynolds and his team regrouped for an intense 24 hour guerilla-style shoot, recreating the bedroom from The Princess Bride, bringing Fred Savage in to reprise his role from that iconic 80s movie as the grandson, complete in his Bears football jersey. The recently released trailers tease another new scene where Wade interacts with a couple of old folks, assuring them that the movie is safe for kids and Grandpas. When the uncensored version of Deadpool 2 hit Blu-ray, a storybook edition of the movie was available as a Target exclusive. The movie is working off that same conceit. It will only be showing for 12 days, though, and will dodge out of theaters Christmas Eve night, making way for some new releases that will include Aquaman and Bumblebee. if this rerelease is a hit, you can expect it to get an extended stay through the rest of the holiday. It's unlikely that the movie will be released on Blu-ray and DVD in any hurry. It's possible that they won't release it until Christmas 2019, enticing even more fans to see it now in theaters while they can. Heck, it might not even come to the home market, instead playing in 2019 as a re-rerelease. Take a look at the new poster, which arrives courtesy of IMP Awards. Like all things Deadpool since the movie's original release, the promotion for this Christmas adventure is killing it.